Since 1976 Land Day is marked by Palestinians on the 30th of March to protest against the grabbing of Palestinian lands by Israel. This year, thousands of Palestinians, along with Israeli and international activists held a series of large-scale peaceful protests against the ongoing occupation and continued theft of Palestinian land by Israel. Demonstrations took place in the villages of Beit Sira (Ramallah area), Zabda (Jenin area), Rafat (Salfit area) and Tulkarm city (Tulkarm area) with marches alongside the annexation barrier where local residents attempted to plant olive trees. 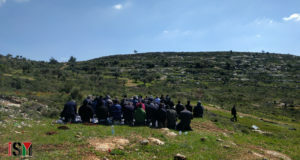 In Beit Sira, about 400 or 500 demonstrators marched down to the village land where they were met by a large presence of Israeli soldiers blocking the path to the area where they wanted to plant olive trees. They were geared up with riot shields, clubs, rubber-coated metal bullets, tear gas and live round. After roughly a 5 minute stand-off, the soldiers decided to attempt to drive the demonstration away with physical force – beatings and sound bombs. The Palestinians responded to this mostly by running away, though some threw stones. The soldiers then used the stone throwing as an opportunity to open up with rubber-coated bullets, which in turn provoked further stone throwing. By the end of the demonstration, the soldiers had used a lot of their tear gas and some live rounds were heard. 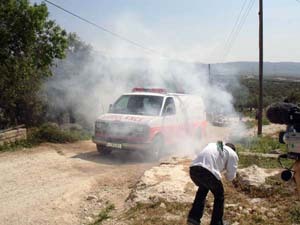 An ambulance was directly hit with a tear gas canister. Several minor injuries were inflicted on Palestinians by the soldiers, including one boy who was shot in the head with a rubber bullet. Thursday’s nonviolent demonstration in Rafat was quickly met by Israeli soldiers and border police jeeps which blocked the main agricultural road leading to the Annexation Wall. 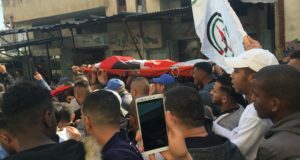 Israeli soldiers threw sound bombs to disperse the demonstration which was peacefully walking with Palestinian flags and signs and chanting “No to the Wall” in Arabic. Despite the sound bombs, the demonstrators pushed forward and more sound bombs and few tear gas canisters were thrown directly in the middle of the crowd. 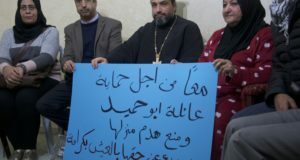 The demonstrators then sat in front of the jeeps and the Palestinians demanded that they be allowed to go to their land. The Israeli military recently declared 300 of the remaining 500 dunam of village lands are in a closed military zone and have restricted access to pasture and olive groves on the east side of the Wall. After the noon prayer in the road, the Palestinians returned to the village. Recently, Rafat and the adjacent village of Deir Ballut have been the site of demolitions and access restrictions. While the construction of the Apartheid Wall in the area has winded down, the Israeli military have issued demolition orders and restricted access to pasture and olive groves on the east side of the Wall. Bulldozers are flattening part of the hillside for unknown purposes.